Just received final professionally printed version of Aerotow-hook (see all notes about this) from Shapeways. It looks gorgeous. The openings are not really open, but it does not matter as they must be drilled to spec anyway. It feels slightly heavier than PLA-printed version, but that does not really matter. This process of first designing product in 3d-cad, then prototyping it with home printer and finalizing it with shapeways is really working. The home printed version has limited strength but this shapeways ‘strong and flexible’-material is extremely strong. Shapeways also have really, and I mean really fast & professional service. You can get your copy of this version from shapeways.com (direct link to product). Also I’ll try to embed shapeways product info directly below. Let’s see how it turns out. Also, just an reminder – if you want to print this directly in your home printer, or ask shapeways (or some other commercial printer) to print it for you just download this file aerotow S 06. It is ready .STL-file, identical to that in shapeways. Send me photos if you try this out. Thanks in advance! With these settings and my Miniboy this thing takes approx 2-3hours to print. Then actual installation is breeze. All holes must be drilled for final spec. STL-file contains holes set so that servo screws are 2mm, installation holes are 2mm and hook pin is 3mm. Just as christmas is approaching I decided to set this to public download. You can copy it from aerotow S 06 (I had to put it into .zip file as wp does not allow .STL-files as media files). As 3d-printers are somewhat rare I also set up shapeways account so that you can get it printed. You can find it here. Actually, I have not printed this using shapeways, but they make great models out of normal .STL-files so this should work well. But just to be cautious I set this product to beta. If there are problems pls. let me know. Also, I am well aware that the use of MG-14 is a bit risky, but this is inteded for light aerotow of light planes etc. Some pics of final sprint are below. 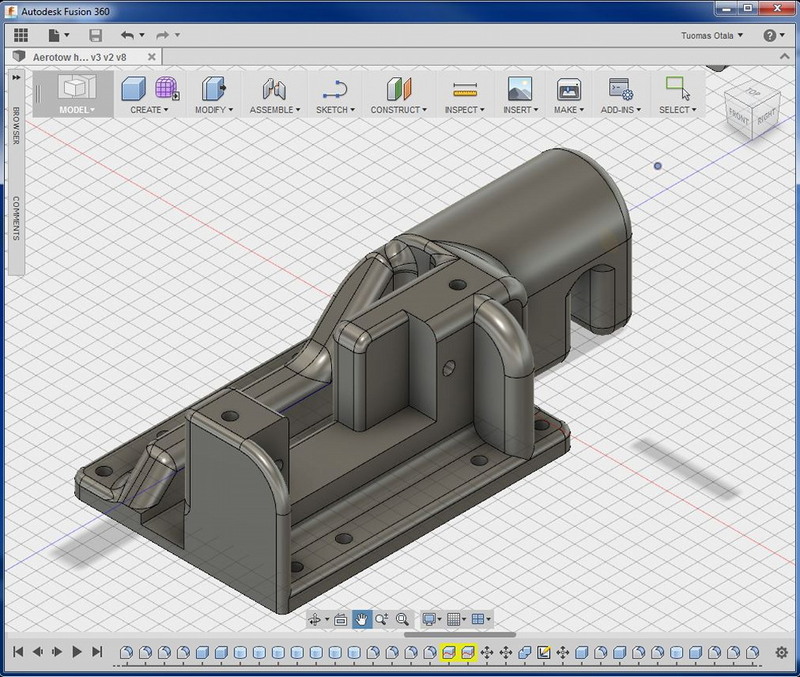 This is first design I have done with 3d-cad. Or actually I have done several ‘things’ which are used in several places, but this is first which has any further use. I am quite happy with Autodesk Fusion 360, but the learning curve was quite steep for me, I have long history of 2d-cad work and model aeroplane design. This new tool is an new tool requiring adaptation of workflow and different mindset. Final disclaimer : this has no guarantee whatsoever. It might work in it’s inteded use or then again it might not. Edit : I added video of Z-400-maiden. It was year 2008 and weather was bad. Really bad. That printed rather well, but still some refinements to design are needed. 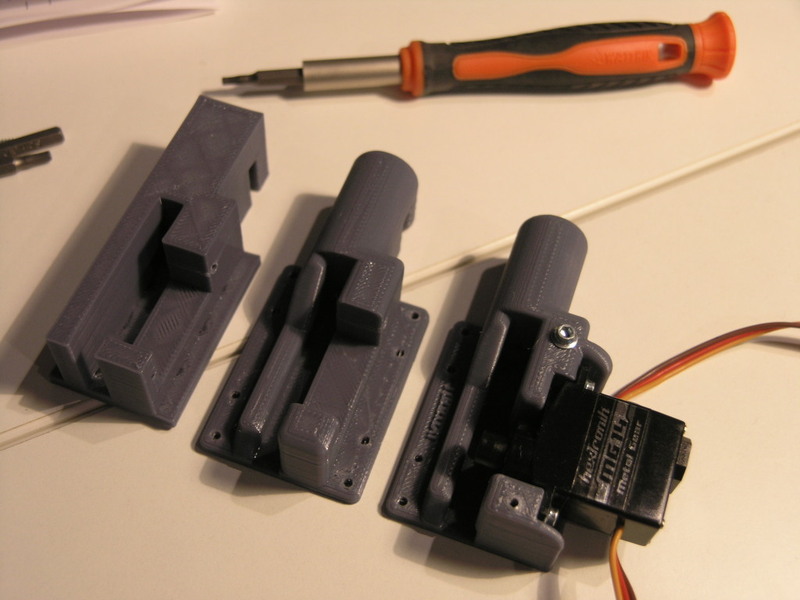 I added further flanges to servo posts to limit splitting of material due self-threading screws. After a while I realized also that the holes for screws need to be just right size to work well. Then one thing would be just avoiding self-threading and using machine screws, like M2. Those screw holes on top of structure are to pin structure from above. This PLA-printed structure is a bit like wood. It will split only laterally, a bit like wood grains. So to limit splitting one could use vertical binding screws. Also, not visible in this picture, the holes through the bottom of part are not all the way through. This is due problem of printing start of first layer. If there are minute details (like holes) in part they are tricky to print because they do not adhere so well to printing table. This might be problem of Miniboy, or something else. One thing still, this is absolutely largest version of this part that can be printed in Miniboy. Lately I have been toying around with an cheap and cheerful 3d-printer, an Mini Fabrikator by Tiny Boy from Hobby King. Actually it works rather well with some limitations, like small print area etc. But it works. Original idea was to utilize 3d-printer for small scale detail parts for kits but is has proven useful for other purposes also. I really think that in future large part of modelling will be done using cad & 3d-printing. It makes things much more exact and also from kit building perspective it is really shortening design and building cycles. 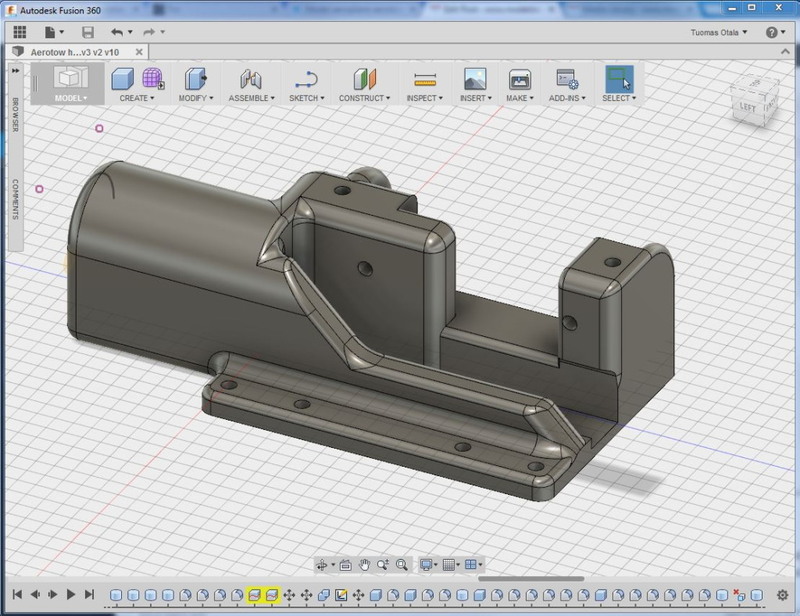 I do initial design in cad anyway so the leap from drawing to 3d-design is quite short. Then to today’s dish. I also have an old electric aerotow plane, an rather rare kit of Zlin Z-400. It flies well, but it’s aerotow hook has suffered .. something. So I decided to make an new hook. This is somewhat rare experiment. Aerotow hooks are normally made out of aluminium or something as strong. Making something using extruded PLA is propably not sane thing, but I can always try it. Also, If it looks nice I can always get it printed at shapeways. First I made some measurements from existing plane. This is quite old plane and hook is really bad looking. Then I proceeded to make an prototype of new and improved design. You might notice extreme overkill in material strengths, but to get this strong enough it must be done this way. 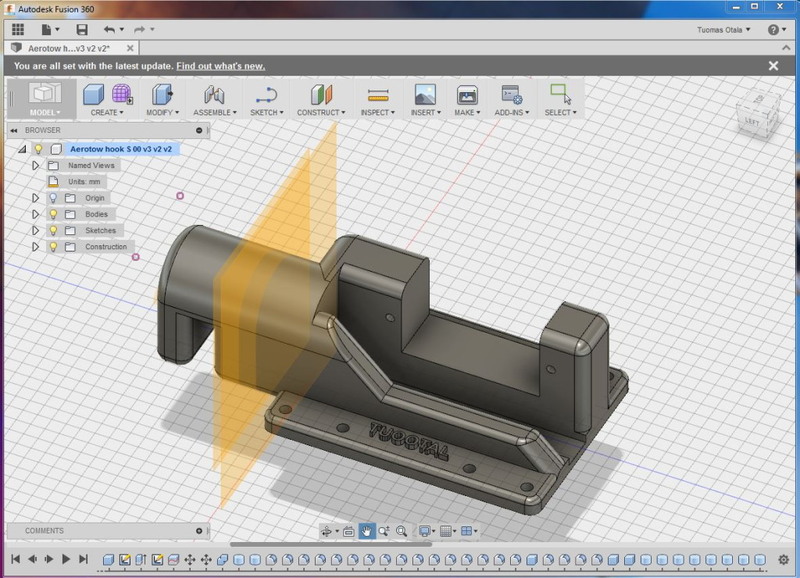 I did design in Fusion 360 which is rather easy to use after some head banging. Then proceeded to print prototype and try it out. Design looked ok, but it was quite clumsy. I made several refinements and currently 3d-printer is churning next version out. You can see design for that below. This is interesting.